The course is devoted to creation of 64-bit applications in C/C++ language and is intended for the Windows developers who use Visual Studio 2005/2008/2010 environment. Developers working with other 64-bit operating systems will learn much interesting as well. The course will consider all the steps of creating a new safe 64-bit application or migrating the existing 32-bit code to a 64-bit system. The course is composed of 28 lessons devoted to introduction to 64-bit systems, issues of building 64-bit applications, methods of searching errors specific to 64-bit code and code optimization. Such questions are also considered as estimate of the cost of moving to 64-bit systems and rationality of this move. The authors of the course: candidate of physico-mathematical sciences Andrey Nikolaevich Karpov and candidate of technical sciences Evgeniy Alexandrovich Ryzhkov. The authors are involved in maintaining the quality of 64-bit applications and participate in development of PVS-Studio static code analyzer for verifying the code of resource-intensive applications. The rightholder of the course is OOO "Program Verification Systems". The company's site: http://www.viva64.com. Contacts: e-mail: support@viva64.com, 300027, Tula, PO box 1800. The course's duration: the course implies that you study each of the 28 lessons on your own in 20-40 minutes. The total time of studying the material is about 18 hours. By the moment of writing the course, there are two most popular 64-bit architectures of microprocessors: IA64 and Intel 64. IA-64 is a 64-bit microprocessor architecture developed by Intel and Hewlett Packard companies together. It is implemented in Itanium and Itanium 2 microprocessors. To learn more about the architecture IA-64 see the following Wikipedia article "Itanium". Intel 64 (EM64T / AMD64 / x86-64 / x64) is an extension of x86 architecture with full backward compatibility. There are many variants of its name and it causes some confusion, but all these names mean the same thing: x86-64, AA-64, Hammer Architecture, AMD64, Yamhill Technology, EM64T, IA-32e, Intel 64, x64. To learn how so many names appeared see the article in Wikipedia: "X86-64". You should understand that IA-64 and Intel 64 are absolutely different, incompatible with each other, microprocessor architectures. Within the scope of this course we will consider only Intel 64 (x64 / AMD64) architecture as the most popular among applied Windows software developers. Accordingly, when we mention Windows operating system, we will mean its 64-bit versions for Intel 64 architecture. For example: Windows XP Professional x64 Edition, Windows Vista x64, Windows 7 x64. The program model Intel 64 available to a programmer in a 64-bit Windows is called Win64, for short. The information given here is based on the first volume of the documentation "AMD64 Architecture Programmer's Manual. Volume 1. Application Programming". The architecture Intel 64 we are considering here, is a simple yet powerful extension of the obsolete commercial architecture x86 with backward compatibility. It adds the 64-bit address space and extends resources to support higher performance of recompiled 64-bit programs. The architecture supports obsolete 16-bit and 32-bit code of applications and operating systems without modifying or recompiling them. The need of a 64-bit architecture is determined by the applications that require a larger address space. First of all, these are high-performance servers, data managers, CAD and, of course, games. These applications will get great benefits from the 64-bit address space and larger number of registers. Few registers available in the obsolete x86 architecture limit performance of computing tasks. The increased number of registers provides the necessary performance for many applications. the capability to use 32-bit operating systems. Nearly all modern operating systems have versions for Intel 64 architecture. For example, Microsoft ships Windows XP x64. Large UNIX developers also ship 64-bit versions, for example, Linux Debian 3.5 x86-64. But it does not mean that the whole code of such a system is 64-bit. Some parts of the operating system and many applications may well remain 32-bit because Intel 64 provides backward compatibility. Thus, the 64-bit version of Windows uses a special mode WoW64 (Windows-on-Windows 64) that translates the calls of 32-bit applications to the resources of the 64-bit operating system. Although a 64-bit processor can theoretically address 16 Ebytes of memory (2^64), Win64 now supports only 16 Tbytes (2^44). There are some reasons for that. Contemporary processors can provide access only to one Tbyte (2^40) of physical memory. The architecture (but not the hardware part) can extend this space up to 4 Pbytes (2^52). But in this case you need an immense amount of memory for the page tables representing it. Besides the limitations described above, the size of memory available in every particular version of the 64-bit Windows depends upon the commercial reasons of Microsoft. 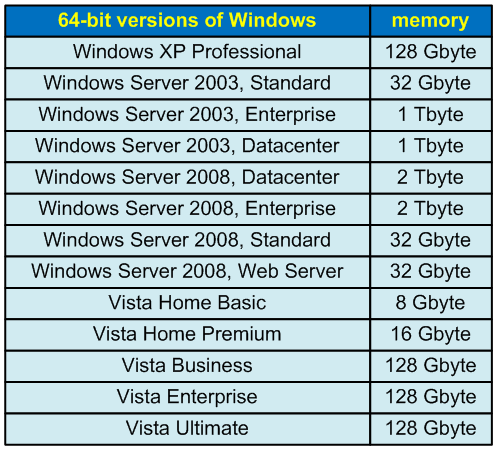 Different Windows versions have different limitations which are illustrated in the table. Like in Win32, the size of a page in Win64 is 4 Kbytes. The first 64 Kbytes of the address space are never displayed, so the lowest correct address is 0x10000. Unlike Win32, system DLL's take more than 4 Gbytes. 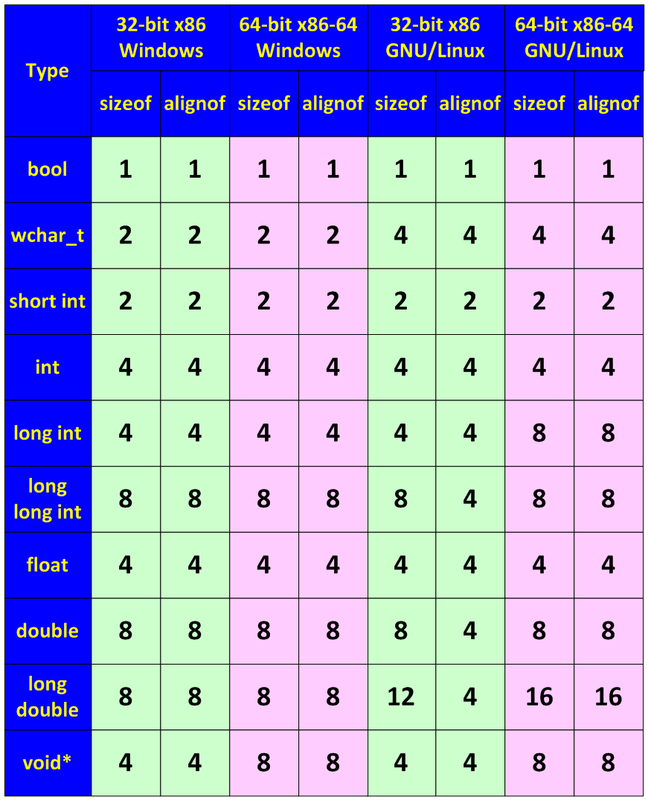 The arguments following the first four integer ones are passed through the stack. To pass float arguments XMM0-XMM3 registers are used as well as the stack. The difference in the calling conventions makes it impossible to use both 64-bit and 32-bit code in one program. In other words, if an application has been compiled for the 64-bit mode, all the libraries (DLL) being used must also be 64-bit. Passing parameters through registers is one of the innovations that make 64-bit programs faster than 32-bit ones. You may achieve an additional performance gain using 64-bit data types. We will tell you about it in the next lesson. Before we start discussing the topic of developing 64-bit program code, let us speak about backward compatibility of 64-bit Windows versions with 32-bit applications. Backward compatibility is arranged through the mechanisms implemented in WoW64. WoW64 (Windows-on-Windows 64-bit) is a subsystem of Windows operating system that allows you to execute 32-bit applications on all the 64-bit versions of Windows. kernel-mode programs compiled for 32-bit operating systems. Different processor architectures have a bit different WoW64. For example, the 64-bit Windows version developed for Intel Itanium 2 processor employs WoW64 to emulate x86 instructions. This emulation is rather resource-intensive in comparison to WoW64 for Intel 64 architecture because the system has to switch from the 64-bit mode to compatibility mode when executing 32-bit programs. WoW64 on Intel 64 (AMD64 / x64) does not require instruction emulation. In this case the WoW64 subsystem emulates only the 32-bit environment through an additional layer between a 32-bit application and the 64-bit Windows API. In some places this layer is thin, in others a bit thicker. For an average program, you may expect 2% performance penalty because of this layer. For some programs, it can be larger. Two per cent is not very much but keep in mind that 32-bit applications work a bit slower under the 64-bit Windows than in the 32-bit environment. Compilation of 64-bit code does not only allow you to avoid using WoW64 but also gives you an additional performance gain. This is explained by architectural modifications in the microprocessor such as an increased number of general-purpose registers. For an average program, you may expect a 5-15% performance gain after mere recompilation. Because of the WoW64 layer, 32-bit programs are less efficient in the 64-bit environment than in their native 32-bit one. But still simple 32-bit applications can get one benefit of being executed in the 64-bit environment. Maybe you know that a program built with the switch "/LARGEADDRESSAWARE:YES" can allocate up to 3 Gbytes of memory if a 32-bit Windows is launched with the switch "/3gb". Well, the same 32-bit program built on a 64-bit system can allocate almost 4 Gbytes of memory (in practice it is usually about 3.5 Gbytes). The WoW64 subsystem isolates 32-bit programs from 64-bit ones by redirecting calls to files and the register. It helps to keep 32-bit programs from accidentally accessing the data of 64-bit ones. For example, a 32-bit application that launches a DLL file from the catalogue "%systemroot%\System32" can accidentally address a 64-bit DLL which is incompatible with the 32-bit program. To avoid this, the WoW64 subsystem redirects the access from the folder "%systemroot%\System32" into the folder "%systemroot%\SysWOW64". This redirection helps you avoid compatibility errors because the 32-bit application will need a special DLL file created to work with 32-bit applications. To learn more about the mechanisms of file system and register redirection see MSDN section "Running 32-bit Applications". Why cannot 32-bit DLL's be used in a 64-bit program? Is there a way to evade this limitation? It is impossible to load a 32-bit DLL from a 64-bit process and execute its code. It is impossible due to the design of 64-bit systems. It is impossible fundamentally. And no tricks and undocumented means will help you. To do this you will have to load and initialize WoW64, not to speak of the kernel structures. Actually, it means that a 64-bit process must be made 32-bit "on the fly". This topic is described more thoroughly in the post "Why can't you thunk between 32-bit and 64-bit Windows?". The only thing we can recommend is to create a surrogate process and work with it through the COM technology. You may read about it in the article "Accessing 32-bit DLLs from 64-bit code". But it is quite easy to load resources from a 32-bit DLL into a 64-bit process. You may do it specifying the flag LOAD_LIBRARY_AS_DATAFILE when calling LoadLibraryEx. It will be quite natural if Microsoft company will stimulate the move to 64-bit systems by gradually canceling the support of 32-bit programs in some versions of Windows operating system. Of course it will be a very slow process but the first steps in this direction have been already made. Many administrators know about a relatively new installation and operation mode of the server version of the operating system called Server Core. It is that very mode the participants of "Windows vs Linux" wars have been speaking of for a long time. One of the reasons that adherents of using Linux on servers referred to was the capability to install the server operating system without graphical interface (GUI). But here is such a capability in Windows Server too. Now, if you install the system in this mode, you will get only the command line without user interface. In the usual (Full Installation) mode, execution of 32-bit applications is enabled by default, but not in Server Core. The tendency is obvious. It will be more and more rational to create 64-bit versions of applications in time as they will be able to work on more operating system versions. Alexey Pahunov's Russian blog is also a very interesting source of information on WoW64: http://blog.not-a-kernel-guy.com/. Alexey is Microsoft company's worker and he personally participates in developing the WoW64 subsystem. You should begin studying 64-bit systems with the question "How much rational it will be to recompile a project for a 64-bit system?". You must answer this question but take your time and think it over. On the one hand, you might lag behind your rivals failing to offer 64-bit solutions on market. On the other hand, you might waste your time developing a 64-bit application that will have no competitive advantages. Here are some factors that will help you make a choice. You should not create a 64-bit version of an application with a short life-cycle. The WoW64 subsystem allows obsolete 32-bit applications to work rather well on 64-bit Windows systems. It is unreasonable to make a program 64-bit if you stop maintaining it in 2 years. The practice shows that the move to 64-bit Windows versions will be very slow and smooth. Perhaps most of your users will use only the 32-bit version of your program solution in the nearest future. You should keep in mind that this course was written in 2009 when most users were working with 32-bit versions of operating systems. But in time 32-bit programs will look more and more unnatural and outdated. If you plan a prolonged development and maintenance of your program product, you should start working on its 64-bit version. Of course you should take your time but keep in mind that the later you have a full 64-bit version, the more problems you are to encounter while maintaining such an application installed on 64-bit Windows versions. After being recompiled for a 64-bit system a program can use huge amounts of memory and its speed will increase in 5-15%. 5-10% of speed gain is achieved due to architectural features of the 64-bit processor, for example, a larger number of registers. And another 1-5% performance gain is determined by the absence of the WoW64 layer that translates calls between 32-bit applications and the 64-bit operating system. For example, Adobe company says that a new 64-bit "Photoshop CS4" is 12% faster than its 32-bit version". Applications involving large memory amounts can expect a great performance gain. These are graphical editors, CAD-systems, GSI CAD, databases and packages for modeling various processes. The capability to store all the data in memory and therefore avoid additionally loading them from the hard disk may increase the speed of such applications not in some per cent but in several times. For example, take Alfa-Bank that integrated an Itanium 2 based platform into their IT-infrastructure. The growth of their investment business had caused the system to fail to manage the increasing load on the current configuration any more: the number of customer support delays sometimes got very critical. The analysis of the situation showed that the bottleneck of the system had nothing to do with processors' performance but it was the limitation of the 32-bit architecture regarding the memory subsystem that allowed using not more than 4 Gbytes of the server address space. The database size was more than 9 Gbytes. It had been used very intensively and that caused a critical loading of the input-output subsystem. Alfa-Bank decided to buy a cluster of two four-processor servers based on Itanium 2 with 12 Gbytes of memory. This decision allowed them to get the necessary performance and fault-tolerance level. As the company representatives say, introduction of Itanium 2 based servers allowed them to eliminate serious issues and manage to save much money. Before planning the work on developing the 64-bit version of your product, make it out if there are 64-bit versions of libraries and components it employs. You should also find out the pricing policy regarding the 64-bit versions of the libraries. All this you may learn on the site of library developers. If there is no support for the libraries, search for alternative means supporting 64-bit systems beforehand. If you are developing libraries, components or other items intended for third-party developers to create software with, you must be quick in creating the 64-bit version of your product. Otherwise, your customers interested in 64-bit versions will have to search for other solutions. For example, some soft- and hardware security developers appeared to be very late in creating 64-bit programs and it made some of their clients choose other tools to protect their software products. There is one more benefit of releasing a 64-bit version of a library: you may sell it as a separate product. Thus, your customers who wish to create both 32-bit and 64-bit applications will have to buy 2 different licenses. For example, Spatial Corporation company sticks to such a policy when selling their library Spatial ACIS. If your solutions still have 16-bit modules, you must get rid of them. 64-bit Windows versions do not support 16-bit applications. I should explain one thing here related to using 16-bit installers. They are still used to install some 32-bit applications. There exists a special mechanism that replaces some of the most popular 16-bit installers with their more contemporary versions on the fly. It might make you think that 16-bit programs still work in the 64-bit environment, but it is a mistake, please, keep it in mind. Do not forget that presence of large assembler code fragments make it much more expensive to create the 64-bit version of an application. If you have decided to create the 64-bit version of your product relying on the factors mentioned above and are ready to spend time on it, the success is not guaranteed yet. You should have all the necessary tools for that and here you might encounter some very unpleasant things. The most obvious yet most serious problem is absence of a 64-bit compiler. When we were writing this text (2009) there was no 64-bit C++ Builder compiler by Embarcadero yet. Its release was expected by the end of 2009. You cannot evade this problem unless you rewrite the whole project employing, for example, Microsoft Visual Studio. But while everything is clear in case of compiler absence, other similar issues might be not so obvious and occur only at the step of porting the project to a new architecture. You should make a research beforehand to find out if you can get all the necessary components to implement the 64-bit version of your product. You might face unpleasant surprises. While making a decision, please keep in mind the last very important factor we have not mentioned here: the price of modifying your program code to compile it in the 64-bit mode. We will tell you how to estimate this price in one of the following lessons. It may be very high and must be considered in planning and scheduling. At first you should make sure that the Visual Studio edition you are using allows building 64-bit code. If you want to develop 64-bit applications using the latest (at the moment of writing this course) Visual Studio 2008 version, here is a table that will help you understand what Visual Studio edition you need. If the Visual Studio edition you are using allows creating 64-bit code, you should check if the 64-bit compiler is installed. Figure 1 shows the page of installing Visual Studio 2008 components where installation of the 64-bit compiler is disabled. 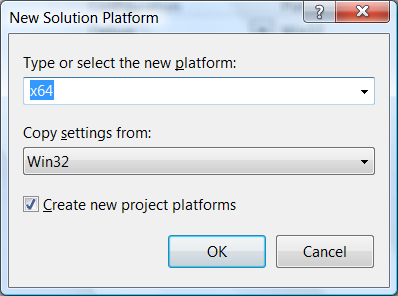 Choose the 64-bit platform (x64) and take the 32-bit version settings as the base (Figure 4). Visual Studio environment will automatically modify those settings that impact the build mode. You have added the new configuration and now may select the 64-bit configuration version and start compiling the 64-bit application. Figure 5 shows how to choose the 64-bit building configuration. If you are lucky, you will not have to adjust the 64-bit project. But this depends upon the project, its complexity and the number of libraries being used. The only thing you should modify right away is the stack size. If your project uses the stack of the default size, i.e. 1 Mbyte, you should change it to 2 Mbytes for the 64-bit version. It is not necessary but it is better to secure yourself from possible issues beforehand. If you use the stack of a size different from that by default, you should make it twice larger for the 64-bit version. To do it find and change the parameters Stack Reserve Size and Stack Commit Size in the project settings (see Figure 6). Having the 64-bit configuration of a project does not mean that it will compile well and work at all. The process of compilation and detection of hidden errors will be discussed in the next lessons. We would like to warn the readers right away that it is impossible to describe the process of building a 64-bit application in every detail. Any project has its own unique settings, so you must be very attentive when adapting them for a 64-bit system. The lesson discusses only the common steps important for any project. These steps will tell you where to begin. Before trying to build your 64-bit application, make sure that all the necessary versions of 64-bit libraries are installed and paths to them are correct. For example, 32-bit and 64-bit library files with "lib" extension usually differ and are situated in different catalogues. Fix the bugs if any. Note. If libraries are presented in the form of the source code, there must be the 64-bit configuration of the project. Keep in mind that you are risking to infringe license agreements when modifying a library to build its 64-bit version by yourself. Visual C++ does not support the 64-bit inline assembler. You must either use an external 64-bit assembler (for example, MASM) or rewrite the assembler code in C/C++. The function strlen() returns the type size_t. 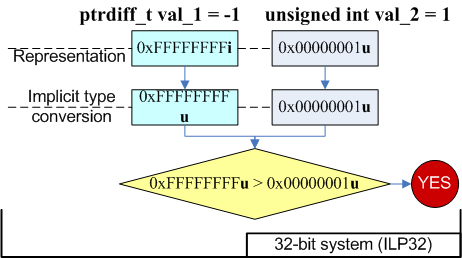 On a 32-bit system, the type size_t coincides with the type unsigned int and the compiler chooses the function "void foo(unsigned int)" to call. 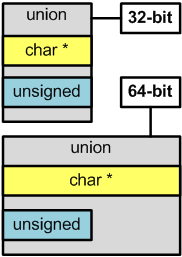 In the 64-bit mode, the types size_t and unsigned int do not coincide. The type size_t becomes 64-bit while the type unsigned int remains 32-bit. As a result, the compiler does not know which of the foo() functions to prefer. The function GetSize() returns the type INT_PTR that coincides with the type int in a 32-bit code. 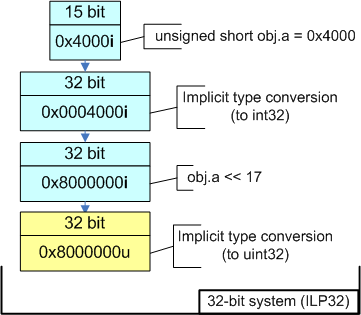 In a 64-bit code, the type INT_PTR is 64-bit and it is implicitly converted to the 32-bit int type. The values of more significant bits get lost during this process and the compiler warns you about it. An implicit type conversion may cause an error if the number of the array items exceeds INT_MAX. To eliminate the warning and the possible error you should assign the type INT_PTR or ptrdiff_t to "len" variable. Do not correct warnings until you have learned the 64-bit error patterns. You might accidentally hide an error failing to correct it and make it more difficult to detect further. You will learn about the patterns of 64-bit errors and methods of detecting and correcting them in the next lessons. You may also see the following articles: "20 issues of porting C++ code on the 64-bit platform", "A 64-bit horse that can count". As most compilation errors and warnings are related to data type incompatibility, we should consider two types - size_t and ptrdiff_t - which are most relevant to us regarding the process of 64-bit code creation. If you are using Visual C++ compiler, these types are integrated into it and you will not need the library files. But if you are using GCC, you will need the header file "stddef.h". size_t is a C/C++ base unsigned integer type. It is the type of the result returned by sizeof operator. The size of the type is chosen so that it could store the maximum size of a theoretically possible array of any type. For example, size_t is 32-bit on a 32-bit system and 64-bit on a 64-bit one. In other words, you may safely store a pointer in a variable of size_t type. Pointers to class functions are an exception but this is a different topic. The type size_t is usually used in loop counters, to index arrays, to store sizes and in address arithmetic. The following types are analogous to size_t: SIZE_T, DWORD_PTR, WPARAM, ULONG_PTR. Although you may store a pointer in size_t, it is better to use another unsigned integer type uintptr_t for that - its name reflects its capability. The types size_t and uintptr_t are synonyms. ptrdiff_t is a C/C++ base signed integer type. Its size is chosen so that it could store the maximum size of a theoretically possible array of any type. This type will be 32-bit on a 32-bit system and 64-bit on a 64-bit one. Like size_t, a variable of ptrdiff_t type can safely store a pointer except for a pointer to a class function. The type ptrdiff_t is also the result of an expression where one pointer is subtracted from another "ptr1-ptr2". The type ptrdiff_t is usually used in loop counters, to index arrays, to store sizes and in address arithmetic. Its analogues are: SSIZE_T, LPARAM, INT_PTR, LONG_PTR. The type ptrdiff_t has a synonym intptr_t whose name reflects it more clearly that it can store a pointer. It is this code that can provide safety, good portability and performance. You will learn from the next lessons why. The types size_t and ptrdiff_t we have described may be called memsize-types. The term "memsize" appeared as an attempt to briefly name all the types that can store sizes of pointers or indexes of the largest arrays. By memsize-types you should understand all the simple C/C++ data types that are 32-bit on a 32-bit architecture and 64-bit on a 64-bit one. Here are examples of memsize-types: size_t, ptrdiff_t, pointers, SIZE_T, LPARAM. Even if you correct all compilation errors and warnings, it does not mean that a 64-bit application will work well. So it is the description and diagnosis of 64-bit errors that we will deal with in the most lessons of our course. And one more thing - do not rely on the switch /Wp64 which is described by many people (often unreasonably) in forum discussions as a wonderful tool able to find 64-bit errors. The switch /Wp64 allows programmers to find some issues that may occur when compiling code for 64-bit systems. The check is implemented in this way: the types marked with the key word __w64 in 32-bit code are interpreted as 64-bit types while being checked. The expression "value32 = size;" will lead to value cutting on a 64-bit system and therefore to a possible error. We want to diagnose this issue. But when we try to compile the 32-bit application, everything is correct and there is no warning. Now we get the warning C4244 that will help us in porting the code to a 64-bit platform. Note that the switch /Wp64 is ignored in the 64-bit compilation mode because all the types already have the necessary size and the compiler performs the necessary checking. So, as you can see, we will get the warning C4244 when compiling the 64-bit version even if the switch /Wp64 is disabled. So, the switch /Wp64 helped developers get somehow ready to use the 64-bit compiler while working with 32-bit applications. All warnings revealed with the help of /Wp64 will turn into compilation errors or remain warnings when building the 64-bit code. And that is all aid you may except from the switch /Wp64 in detecting errors. By the way, the switch /Wp64 is considered deprecated in Visual Studio 2008 because it is high time we started to compile 64-bit applications instead of going on to get ready for it. In fact, all errors occurring in the code when it is recompiled for 64-bit systems arise from inaccurate compliance with C/C++ standard ideology. But we do not find it very reasonable to follow this recommendation: "write correct programs and there will be no 64-bit errors". One cannot argue against it but it has little relevance to real projects. There is much C/C++ code in the world that has been written for many decades. The purpose of our lessons is to arrange all the 64-bit errors into a set of patterns that will help you detect defects and instruct you how to eliminate them. We will speak a lot about 64-bit errors in future but here are two examples for you to understand what these errors are. The first is an example of using the magic constant 4 that serves as the size of a pointer what is incorrect in 64-bit code. Note that this code worked quite well in the 32-bit version and was not diagnosed as dangerous by the compiler. The second is an example of an error in the data reading mechanism. This code is correct in the 32-bit version and the compiler does not react to it. But this code fails to correctly read the data saved by the 32-bit version of the program. I would like to comment right away upon the 64-bit error patterns and error examples that will be discussed in many following lessons. People often argue that actually these are not errors related to 64 bits but the errors arising from an incorrectly written and badly portable code. And they also say that many errors can be found when porting code not only to the 64-bit architecture but simply to any architecture where the base types have other sizes. Yes, that is right! We keep this in mind. But our goal is not to study the issue of code portability as such. In these lessons we are going to solve a particular local task - to help developers in mastering 64-bit platforms that become more and more popular. When speaking of 64-bit error patterns we will consider examples of code that is correct on 32-bit systems but may cause faults when being ported to the 64-bit architecture. There are various techniques of detecting errors in program code. Let us consider the most popular ones and see how efficient they are in finding 64-bit errors. The oldest and the most proved and reliable approach to error search is code review. This method relies on reading the code by several developers together following some rules and recommendations described in the book by Steve McConnell "Code Complete" (Steve McConnell, "Code Complete"). Unfortunately, this method cannot be applied to large-scale testing of contemporary program systems due to their huge sizes. Code review may be considered in this case rather a good means of education and avoiding 64-bit errors in a new code being developed. But this method will be too expensive and therefore unacceptable in searching for the already existing errors. You would have to view the code of the whole project to find all 64-bit errors. The means of static code analysis will help those developers who appreciate the regular code review but do not have enough time to do that. The main purpose of static code analysis is to reduce the amount of code needed to be viewed by a human and therefore reduce the time of code review. Rather many programs refer to static code analyzers which have implementations for various programming languages and provide a lot of various functions from simple code alignment control to complex analysis of potentially dangerous fragments. The advantage of static analysis is its good scalability. You can test a project of any size in reasonable time with its help. And testing the code with static analyzer regularly will help you detect many errors at the stage of only writing the code. The static analysis technique is the most appropriate method to detect 64-bit errors. Further, when discussing 64-bit error patterns, we will show you how to diagnose these errors using Viva64 analyzer included into PVS-Studio. In the next lesson you will learn in more detail about the static analysis methodology and PVS-Studio tool. By the white box method we will understand the method of executing the maximum available number of different code branches using a debugger or other tools. The more code is covered during the analysis, the more complete the testing is. Also, the white box testing is sometimes understood as simple debugging of an application in order to find some known error. It became impossible a long time ago to completely test the whole program code with the white box method due to huge sizes of contemporary applications. Nowadays, the white box method is convenient to use when an error is found and you want to find out what has caused it. Some programmers oppose the white box technique denying the efficiency of real-time program debugging. The main reason they refer to is that enabling a programmer to watch the process of program execution and change it along the way leads to an unacceptable programming approach implying correction of code by the trial-and-error method. We are not going to discuss these debates but I would like to note that the white box testing is too expensive to use for enhancing the quality of large program systems anyway. It must be evident to you that complete debugging of an application for the purpose of detecting 64-bit errors is unreal just like the complete code review. We should also note that the step-by-step debugging might be impossible when debugging 64-bit applications that process large data arrays. Debugging of such applications may take much more time. So you should consider using logging systems or some other means to debug applications. The black box method has shown much better results. Unit tests refer to this type of testing. The working principle of this technique is writing a set of tests for separate units and functions that checks all the main modes of their operation. Some authors refer unit-testing to the white box method because it relies on knowledge of the program organization. But we think that functions and units being tested should be considered black boxes because unit tests do not take into account the inner organization of a function. This viewpoint is supported by an approach when tests are developed before the functions themselves are written and it provides an increased level of the control over their functionality in terms of specification. Unit tests have proved to be efficient in developing both simple and complex projects. One of the advantages of unit testing is that you may check if all the changes introduced into the program are correct right along the development process. They try to make it so that tests are run in only a few minutes - it allows the developer who has modified the code to see an error and correct it right away. If it is impossible to run all the tests at once, long-term tests are usually launched separately, for example, at night. It also contributes to a quick detection of errors, at least in the next morning. When using unit tests to search for 64-bit errors, you are likely to encounter some unpleasant things. Seeking to make quick tests, programmers try to involve a small amount of calculations and data to be processed while developing them. For example, when you develop a test for the function searching for an array item, it does not matter if there will be 100 or 10 000 000 items. A hundred of items is enough but when the function processes 10 000 000, its speed is greatly reduced. But if you want to develop efficient tests to check this function on a 64-bit system, you will have to process more than 4 billion items! You think that if the function works with 100 items, it will work with billions? No. Here is an example. The error here is in using the type unsigned for the loop counter. As a result, the counter is overflowed and an eternal loop occurs when processing a large array on a 64-bit system. Note. It might be so that this example will not reveal an error with some settings of the compiler. To understand this strange thing, see the article "A 64-bit horse that can count". As you may see from the example, you cannot rely on obsolete sets of unit tests if your program processes a large data amount on a 64-bit system. You must extend them taking into account possible large data amounts to be processed. Unfortunately, it is not enough to write new tests. Here we face the problem of the time it will take the modified test set processing large data amounts to complete this work. Consequently, such tests cannot be added to the set you could launch right along the development process. Launching them at night also causes issues. The total time of running all the tests may increase more than ten times. As a result, the test running time may become more than 24 hours. You should keep this in mind and take it very seriously when modifying the tests for the 64-bit version of your program. This method can be considered the final step of any development process but you should not take it as a good and safe technique. Manual testing must exist because it is impossible to detect all the errors in the automatic mode or with code review. But you should not fully rely on it either. If a program is low-quality and has a lot of defects, it may take you a long time to test and correct it and still you cannot provide the necessary quality. The only way to get a quality program is to have a quality code. That is why we are not going to consider manual testing as an efficient method of detecting 64-bit errors. To sum it up, I would like to say that you should not rely on only one of the methods we have discussed. Although static analysis is the most efficient technique of detecting 64-bit errors, a quality application cannot be developed when only a couple of testing methodologies are involved. Static analyzers may be general-purpose (for example, Microsoft PREFast, Gimpel Software PC-lint, Parasoft C++test) and special-purpose to search for some particular error classes (for example, Chord to verify concurrent Java programs). Usually static analysis tools are rather expensive and require that you know how to use them. They often provide rather flexible yet complicated subsystems of settings and false alarm suppression. Because of this static analyzers are used, as a rule, in companies providing a mature level of software development processes. In exchange for being complicated to use static code analyzers allow programmers to detect a lot of errors at the early stages of program code development. The practice of using static analysis also disciplines programmers and helps managers control young employees. Scalability. Static analysis allows you to analyze both a small and a large project with equal simplicity. Labor intensiveness rises directly as the project size. You may easily distribute the project analysis among several developers. You need just to distribute the project's parts among the programmers. PVS-Studio is a package of static code analyzers to check contemporary resource-intensive applications. PVS-Studio includes a special static analyzer Viva64 intended for diagnosing 64-bit errors. PVS-Studio analyzer is designed for a Windows-platform. 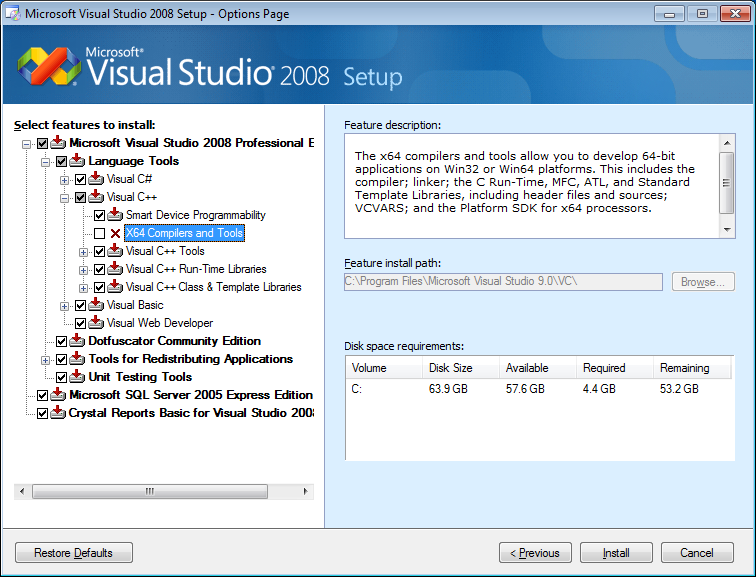 It integrates into Microsoft Visual Studio 2005/2008/2010 development environment (see Figure 2). PVS-Studio's interface allows you to filter diagnostic warnings using various techniques and also save and load warning lists. Operating system: Windows 7 / Windows 2000/XP/2003/Vista/2008 x86 or x64. Note that your operating system does not necessarily need to be a 64-bit one to enable you to analyze 64-bit applications. Development environment: Microsoft Visual Studio 2005/2008/2010 (Standard Edition, Professional Edition, Team Systems). You must have a Visual Studio component called "X64 Compilers and Tools" installed to be able to test 64-bit applications. It is included into all Visual Studio versions we have enumerated and can be installed through Visual Studio Setup. Note that PVS-Studio cannot work with Visual C++ Express because this system does not support add-in modules. Hardware: PVS-Studio can work on systems that have not less than 1 Gbyte of memory (it is recommended to have 2 Gbytes or more); the analyzer can work employing several cores (the more the cores, the faster the code analysis is). All the errors that can be diagnosed are thoroughly described in Help system that integrates into MSDN and becomes available after you install PVS-Studio. You may also see Help system on PVS-Studio online on our site. The PVS-Studio distribution kit also contains special projects serving as examples of code flaws that will help you study the analyzer. 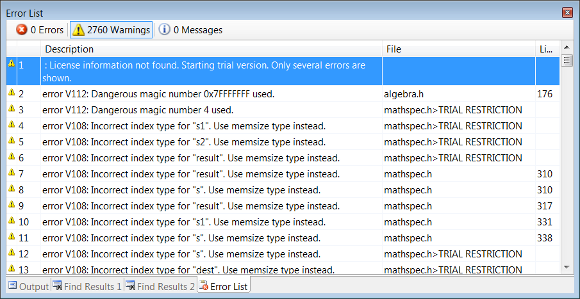 the demo-version hides the numbers of most lines containing errors and shows only some of them (although it detects all errors in the project). But we made an exception for the demonstration projects included into PVS-Studio - when you analyze these projects, you see all the numbers of the lines with defects. At present, PVS-Studio analyzer provides the fullest diagnosis of 64-bit errors. You may study the comparison characteristics in the article "Comparing PVS-Studio with other code analyzers". While studying various patterns of errors in the next lessons, we will often refer to PVS-Studio to show you how to detect them. Typical examples given in most articles on the issues of porting programs to 64-bit systems refer to incorrect use of the functions printf, scanf and their variants. In the first case, the programmer does not take into account that the type size_t is not equivalent to the type unsigned on a 64-bit platform. It will result in printing an incorrect result if value > UINT_MAX. In the second case, the author does not take into account that the size of the pointer might be more than 32 bits in future. As a result, this code will cause a buffer overflow on the 64-bit architecture. Incorrect use of functions with the variable number of arguments is a common error not only for 64-bit architectures but for all architectures. It is explained by the fundamental danger of using these C++ constructs. It is generally accepted to refuse using them and resort to safe programming methods. We highly recommend you to modify your code and employ safe methods. For example, you may replace printf with cout, sprintf with boost::format or std::stringstream. This recommendation is often criticized by Linux developers who argue that gcc compiler checks if the format string corresponds to the actual arguments passed into the function printf. But they forget that the format string may be called from other program parts or loaded from resources. In other words, the format string is seldom present explicitly in the code of a real program and therefore the compiler cannot check it. If developers use Visual Studio 2005/2008 they will not be able to get the warning on the code like "void *p = 0; printf("%x", p);" even using the switches /W4 and /Wall. The specifiers are well described in the Wikipedia article "printf". // PR_SIZET on Win64 = "I"
// PR_SIZET on Win32 = ""
// PR_SIZET on Linux64 = "z"
// The result is incorrect values of pointers p1 and p2. Manipulation with the pointers using "%X" resulted in an incorrect program behavior on a 64-bit system. This example shows how dangerous may be the depths of large and complex projects written for many years. If your project is rather large and obsolete, you might encounter very interesting fragments like this one. Those types that change their sizes on a 64-bit system, i.e. memsize-types, are dangerous for the functions with the variable number of arguments. PVS-Studio static analyzer warns the programmer about such types with the help of the V111 diagnostic warning. This code works well on a 32-bit architecture and allows you to set a bit with numbers from 0 to 31 into one. 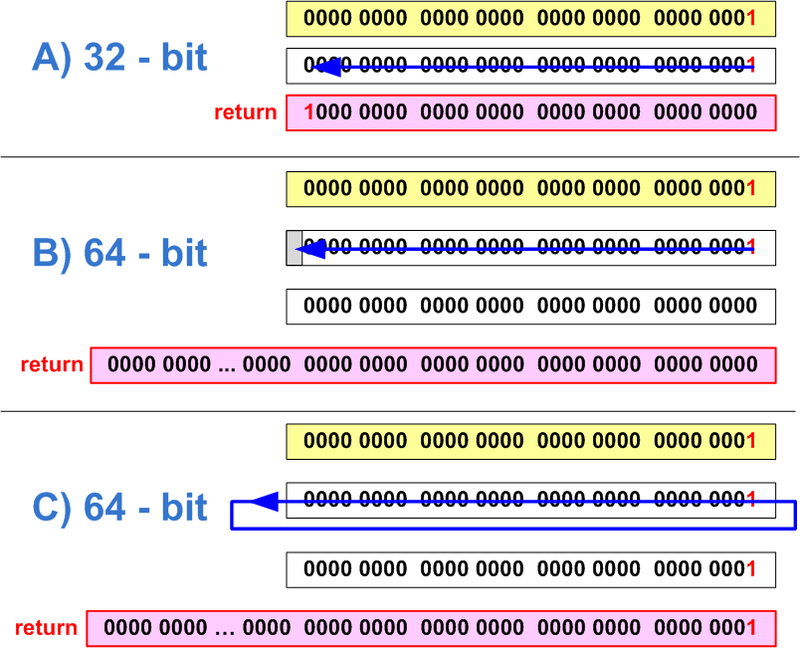 After porting the program to a 64-bit platform you need to set bits from 0 to 63. But this code will never set the bits with the numbers 32-63. Note that the numerical literal "1" has int type and causes an overflow when a shift in 32 positions occurs as shown in Figure 1. As a result, we will get 0 (Figure 1-B) or 1 (Figure 1-C) depending on the compiler implementation. Note also that the non-corrected code will lead to one more interesting error. When setting the 31-st bit on a 64-bit system, the function's result will be the value 0xffffffff80000000 (see Figure 2). The result of the expression 1 << 31 is the negative number -2147483648. This number is presented in a 64-bit integer variable as 0xffffffff80000000. Figure 2 - The error of setting the 31-st bit on a 64-bit system. You should remember and take into consideration the effects of shifting values of different types. To better understand all said above, consider some interesting expressions with shifts in a 64-bit system shown in Table 1. The type of errors we have described is considered dangerous not only from the viewpoint of program operation correctness but from the viewpoint of security as well. Potentially, by manipulating with the input data of such incorrect functions one can get inadmissible rights when, for example, dealing with processing of access permissions' masks defined by separate bits. 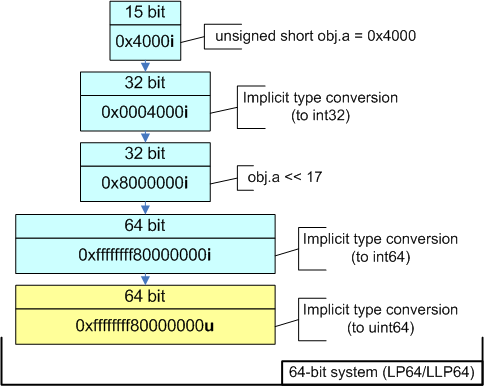 Questions related to exploiting errors in 64-bit code for application cracking and compromise are described in the article "Safety of 64-bit code". In the 32-bit environment, the order of calculating the expression will be as shown in Figure 3. Now let us see the consequence of the sign extension in a 64-bit code. The sequence of calculating the expression is shown in Figure 4. The member of "obj.a" structure is converted from the bit field of "unsigned short" type to "int". "obj.a << 17" expression has "int" type but it is converted to ptrdiff_t and then to size_t before it is assigned to addr variable. As a result, we will get the value 0xffffffff80000000 instead of 0x0000000080000000 expected. Be careful when working with bit fields. To avoid the situation described in our example we need only to explicitly convert "obj.a" to size_t type. Potentially unsafe shifts are detected by PVS-Studio static analyzer when it detects an implicit extension of a 32-bit type to memsize type. The analyzer will warn you about the unsafe construct with the diagnostic warning V101. The shift operation is not suspicious by itself. But the analyzer detects an implicit extension of int type to memsize type when it is assigned to a variable, and informs the programmer about it to check the code fragment that may contain an error. Correspondingly, when there is no extension, the analyzer considers the code safe. For example: "int mask = 1 << bitNum;". Sometimes you may see errors there is nobody's fault about but they are still errors. Imagine that a long-long time ago (in Visual Studio 6.0) a project was developed that contained the class CSampleApp which was an heir of CWinApp. The base class had the function WinHelp. The heir overlapped this function and performed all the necessary actions. It looked as shown in Figure 1. Let us consider one more error by an example taken from real life. There is a wonderful component library BCGControlBar. You are likely to have heard about it because some components of BCGSoft Ltd company are included into Microsoft Visual Studio 2008 Feature Pack. Well, if you download the trial version of this library, install it and search for the word "WinHelp" through .h-files... you will see that wherever this function is supposedly overlapped the parameter DWORD is used instead of DWORD_PTR. And it means that Help system will behave incorrectly in these classes when ported to a 64-bit system. The function is defined in the base class and in the heir-class. We have chosen the 13-th lesson to discuss the errors related to address arithmetic deliberately. The errors related to pointer arithmetic in 64-bit systems are the most insidious and it would be good that number 13 made you more attentive. The main idea of the pattern is - use only memsize-types in address arithmetic to avoid errors in 64-bit code. This sample works correctly with pointers if the result of the expression "a16 * b16 * c16" does not exceed INT_MAX (2147483647). This code could always work correctly on a 32-bit platform, because on the 32-bit architecture a program does not have so much memory to create an array of such a size. On the 64-bit architecture, this limitation has been removed and the size of the array may well get larger than INT_MAX items. Suppose we want to shift the value of the pointer in 6.000.000.000 bytes, so the variables a16, b16 and c16 have the values 3000, 2000 and 1000 respectively. When calculating the expression "a16 * b16 * c16", all the variables will be cast to "int" type at first, according to C++ rules, and only then they will be multiplied. An overflow will occur during the multiplication. The incorrect result will be extended to the type ptrdiff_t and the pointer will be calculated incorrectly. According to C++ rules, the variable A of the type int is converted to unsigned. A and B are summed and we get the value 0xFFFFFFFF of unsigned type. The expression "ptr + 0xFFFFFFFFu" is calculated. The result of this process depends upon the size of the pointer on a particular architecture. If the addition takes place in the 32-bit program, the expression is equivalent to "ptr - 1" and the program successfully prints the value "3". In the 64-bit program, the value 0xFFFFFFFFu is fairly added to the pointer. As a result, the pointer gets far outside the array while we encounter some troubles when trying to get access to the item by this pointer. It trains programmers to be inaccurate when working with pointers. You might forget all the details of the code some time later and again redefine one of the variables with unsigned type by mistake. It is potentially dangerous to use non-memsize types together with the pointers. Suppose the variable Delta of int type participates in an expression with a pointer. This expression is quite correct. But an error may hide in the process of calculating the variable Delta because 32 bits might be not enough to perform the necessary calculations while working with large data arrays. You can automatically avoid this danger by using a memsize-type for the variable Delta. A code that uses the types size_t, ptrdiff_t and other memsize-types when working with pointers leads to a more appropriate binary code. We will speak about it in one of the following lessons. We single out this type of errors to make our description more structured because array indexing with the use of square brackets is just another way of writing the address arithmetic we have discussed above. The first error lies in the fact that an eternal loop may occur if the size of the processed data exceeds 4 Gbytes (0xFFFFFFFF), because the variable "i" has "unsigned" type and will never reach a value larger than 0xFFFFFFFF. It is possible but not certain - it depends upon the code the compiler will build. For example, there will be no eternal loop in the debug mode while it will completely disappear in the release version, because the compiler will decide to optimize the code using the 64-bit register for the counter and the loop will become correct. All this adds confusion and a code that was good yesterday stops working today. The second error is related to negative values of the indexes serving to walk the array from end to beginning. This code works in the 32-bit mode but crashes in the 64-bit one right with the first iteration of the loop as an access outside the array's bounds occurs. Let us consider the cause of this behavior. Although everything written below is the same as in the example with "ptr = ptr + (A + B)", we resort to this repetition deliberately. We need to show you that a danger may hide even in simple constructs and take various forms. The expression "-i" has "unsigned" type and equals 0x00000000u. The variable "one" is extended from the type "int" to the type "unsigned" and equals 0x00000001u. Note: the type "int" is extended (according to C++ standard) to the type "unsigned" if it participates in an operation where the second argument has the type "unsigned". 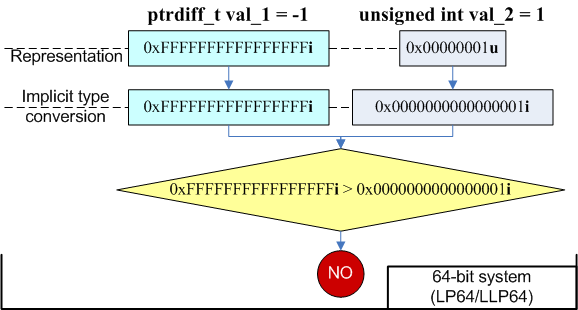 Two values of the type "unsigned" participate in a subtraction operation and its result equals 0x00000000u - 0x00000001u = 0xFFFFFFFFu. Note that the result has "unsigned" type. On a 32-bit system, calling an array by the index 0xFFFFFFFFu is equivalent to using the index "-1". I.e. end[0xFFFFFFFFu] is analogous to end[-1]. As a result, the array's item is processed correctly. But the picture will be different in a 64-bit system: the type "unsigned" will be extended to the signed "ptrdiff_t" and the array's index will equal 0x00000000FFFFFFFFi64. It results in an overflow. To correct the code you need to use such types as ptrdiff_t and size_t. To completely convince you that you should use only memsize-types for indexing and in address arithmetic expressions, here is the code sample for you to consider. This code is taken from a real program of mathematical modeling where the amount of memory is the most important resource, so the capability of using more than 4 Gbytes on a 64-bit architecture significantly increases the computational power. Programmers often use one-dimensional arrays in programs like this to save memory while treating them as three-dimensional arrays. For this purpose, they use functions analogous to GetCell which provide access to the necessary items. But the code above will work correctly only with arrays that contain less than INT_MAX items because it is 32-bit "int" types that are used to calculate the item's index. They know that, according to C++ rules, the expression to calculate the index has the type "ptrdiff_t" and hope to avoid an overflow thereby. But the overflow may occur inside the expression "y * Width" or "z * Width * Height" because it is still the type "int" which is used to calculate them. Address arithmetic errors are well diagnosed by PVS-Studio tool. The analyzer warns you about potentially dangerous expressions with the diagnostic warnings V102 and V108. This code works correctly in the 32-bit mode and prints numbers 3 and 1 on the screen. On testing this code we get a warning only on one string with the expression "p[0u - 1]". And this warning is quite right! If you compile and launch this code sample in the 64-bit mode, you will see the value 3 printed on the screen and the program will crash right after it. If you are sure that the indexing is correct, you may change the corresponding parameter of the analyzer on the settings tab Settings: General or use filters. You may also use an explicit type conversion. This sample is correct for 32-bit systems and incorrect for 64-bit ones. Changing the member m_n on a 64-bit system we work only with a part of the pointer m_p (see Figure 1). I hope you have already rested from the 13-th lesson and now are ready to study one more important error pattern related to arithmetic expressions in which types of different capacities participate. This is an example of an eternal loop occurring if Count > UINT_MAX. Suppose that this code works well on a 32-bit system with fewer iterations than UINT_MAX. But the 64-bit version of the program can process more data and may need more iterations. Since the values of Index variable lie within the range [0..UINT_MAX], the condition "Index != Count" will never be fulfilled and it leads to the eternal loop. Note. Consider that this sample may work well at some particular settings of the compiler. Sometimes it is a source of much confusion because the code seems to be correct. In one of the following lessons we will tell you about phantom errors that reveal themselves only some time later. If you are already longing to learn why the code behaves so strangely, see the article "A 64-bit horse that can count". To correct the code you should use only memsize-types in the expressions. In our example we may change the type of the variable Index from "unsigned" to size_t. We have already examined such examples with an arithmetic overflow that occurs when calculating expressions using non-memsize types. The result was incorrect of course. The search and detection of this code fragment was complicated by the fact that compilers usually do not generate any warnings on it. From the viewpoint of C++ language it is an absolutely correct construct: several variables of "int" type are multiplied together, after that the result is implicitly extended to the type ptrdiff_t and is assigned to a variable. does not guarantee a correct result at all. It guarantees only that the expression "ptrdiff_t (x) + y * z" will have the type "ptrdiff_t". ptrdiff_t v2 = ptrdiff_t (x) + ptrdiff_t (y) * ptrdiff_t (z); // OK! As a result, each of the operators will be cast to the type "ptrdiff_t" before the multiplication and we will get the correct result. Note. If there are integer calculations in your program and they need the control over overflows, resort to the class SafeInt - you may learn about its implementation and see its description in MSDN. //Output on 32-bit system: "val_1 is greater than val_2"
//Output on 64-bit system: "val_1 is not greater than val_2"
According to C++ rules, the variable val_1 is extended to the type "unsigned int" and becomes the value 0xFFFFFFFFu on a 32-bit system - the condition "0xFFFFFFFFu > 1" is fulfilled. On a 64-bit system, however, it is the variable val_2 that gets extended to the type "ptrdiff_t" - in this case it is the expression "-1 > 1" which is checked. Figures 1 and 2 give the outlines of the transformations that take place. Actually, it would be more correct not to compare signed and unsigned types at all, but this issue lies beyond the current topic. The result of the expression "end - begin" has the type "ptrdiff_t". Since the function returns the type "unsigned", there occurs an implicit type conversion that leads to a loss of the more significant bits of the result. So, if the pointers begin and end refer to the beginning and the end of the array whose size is more than UINT_MAX (4Gb), the function will return an incorrect result. This code resembles an example with incorrect pointer arithmetic discussed in the 13-th lesson, does not it? Right, here we have the same. We get the incorrect result when the actual argument, equaling 0xFFFFFFFF and having the type "unsigned", is implicitly extended to the type "ptrdiff_t". Errors occurring in 64-bit systems when integer types and memsize-types are used together are presented in many C++ syntactic constructs. To diagnose these errors several diagnostic warnings are used. PVS-Studio analyzer warns the programmer about possible errors with the help of these warnings: V101, V103, V104, V105, V106, V107, V109, V110, V121. Although the expression itself multiplies together the arguments extending their types to "ptrdiff_t", an error may hide in the procedure of calculating these arguments. That is why the analyzer still warns you about the mixed types: "V104: Implicit type conversion to memsize type in an arithmetic expression". The warnings V201 and V202 will help you detect such incorrect code fragments. The type double has the capacity of 64 bits and is compatible with the standard IEEE-754 on 32-bit and 64-bit systems. Note. IEEE 754 is a widely spread standard of floating-point number presentation format used both in software and many hardware (CPU and FPU) implementations of arithmetic operations. Many compilers of programming languages use this standard to store and perform mathematical operations. This code may be justified when it is executed on a 32-bit system because the type double has 52 significant bits and can store a 32-bit integer value without loss. But when you save a 64-bit integer number into double, the exact result will be lost (see Figure 1). Perhaps an approximate number will do in your program, but I would like to warn you just in case that you may encounter such consequences on the new architecture. And in no case would I advise you to mix integer arithmetic and floating-point arithmetic. This error pattern is rather rare. However, these rare errors are in no way less dangerous. The analyzer PVS-Studio warns you about a potential error with the help of the diagnostic warning V113. If you need to find explicit type conversions (from memsize-types to double and vice versa), you may enable the warning V203. In this case the compiler generates a special code to deal with the non-aligned data. It is not very efficient since the access to the data will be several times slower. If your purpose is to make the structure's size smaller, you can get the best result arranging the data in decreasing order of their sizes. We will speak about it in more detail in one of the next lessons. Exceptions are not generated when you address non-aligned data on the architecture x64 but you still should avoid them - first, because the access to these data is very much slower, and second, because you may want to port the program to the platform IA-64 in the future. If we want to allocate an amount of memory needed to store an object of MyPointersArray type that contains 5 pointers, we should consider that the beginning of the array m_arr will be aligned on an 8-byte boundary. 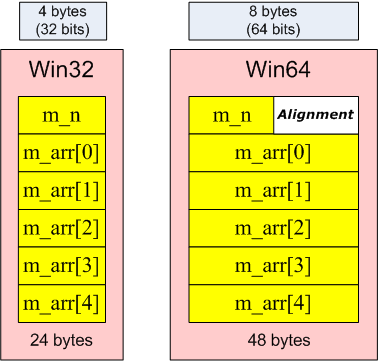 The arrangement of data in memory in various systems (Win32/Win64) is shown in Figure 1. In this code we find out the offset of the structure's last member and add this value to its size. You can find out the offset of a structure's or class's member with the help of the macro "offsetof" or FIELD_OFFSET. Linux-developers may encounter one more trouble related to alignment. You may learn what it is from our blog-post "Change of type alignment and the consequences". Since work with non-aligned data does not cause an error on the x64 architecture and only reduces performance, the tool PVS-Studio does not warn you about packed structures. But if the performance of an application is crucial to you, we recommend you to look through all the fragments in the program where "#pragma pack" is used. This is more relevant for the architecture IA-64 but PVS-Studio analyzer is not designed to verify programs for IA-64 yet. If you deal with Itanium-based systems and are planning to purchase PVS-Studio, write to us and we will discuss the issues of adapting our tool to IA-64 specifics. PVS-Studio tool allows you to find errors related to calculation of objects' sizes and offsets. The analyzer detects dangerous arithmetic expressions containing several operators sizeof() (it signals a potential error). The number of the corresponding diagnostic message is V119. Figure 2 represents types' sizes and their alignment. To learn about objects' sizes and their alignment on various platforms, see the code sample given in the blog-post "Change of type alignment and the consequences". Figure 2 - Types' sizes and their alignment. A careless programmer saves into and then selects from the stack values of different types ("ptrdiff_t" and "int"). Their sizes coincide on the 32-bit system and everything is quite okay. But when the size of the type "ptrdiff_t" changes on the 64-bit system, the number of bytes saved into the stack gets larger than the number of bytes loaded then from the stack. I think this type of errors is clear to you and you understand that one should be very careful about calls to overloaded functions when passing actual arguments of a memsize-type. PVS-Studio does not diagnose this pattern of 64-bit errors. First, it is explained by the fact that we have not encountered such an error in a real application yet, and second, diagnosis of such constructs involves some difficulties. Please write to us if you encounter such an error in real code. A growth of structures' sizes is not an error by itself but it may lead to consumption of an unreasonably large memory amount and therefore to performance penalty. Let us consider this pattern not as an error but as a cause of 64-bit code inefficiency. Data in structures of C++ language are aligned in such a way as to make the access to them most effective. Some microprocessors cannot address non-aligned data at all and the compiler has to generate a special code to deal with them. Those microprocessors that can address non-aligned data do it much less efficiently. That is why the C++ compiler leaves empty locations between structures' fields to align them on the addresses of machine words and therefore speed up the access to them. You may disable alignment using special #pragma directives to reduce the amount of memory being consumed but we are not interested in this way now. The amount of memory being used may often be greatly reduced by simply changing the order of fields in the structure without performance penalty. This structure will take 12 bytes on a 32-bit system and we cannot make it less. Each field is aligned on a 4-byte boundary. Even if we move m_bool to the end, it will not change anything. The compiler will still make the structure's size multiple of 4 bytes to align such structures in arrays. The structure MyStructOpt takes 16 bytes instead of 24. The arrangement of the fields is represented in Figure 1. It is rather a great saving if we use, for instance, 10 million items. In this case we will save 80 Mbytes of memory but what is more significant, we will enhance performance. If there will be few structures, their sizes will not matter - the access will be performed with the same speed. But when there are many items, such things as cash, the number of memory accesses, etc. become significant. And you may say with certainty that 160 Mbytes of data will take less time to process than 240 Mbytes. Even a simple access to all the array items for reading will be faster. You may ask according to what rules the compiler aligns the data. We will answer briefly, but if you want to study this issue in more detail, read the book by Jeffery Richter "Programming Applications for MS Windows". This question is considered rather thoroughly there. we make this structure's size only 24 bytes. You may reduce this structure's size but there is no practical sense in it. You may try such a simple sample and see that it works. What matters is the way the optimizing compiler will build the code. It depends upon the size of the loop's body if the code will work or not. 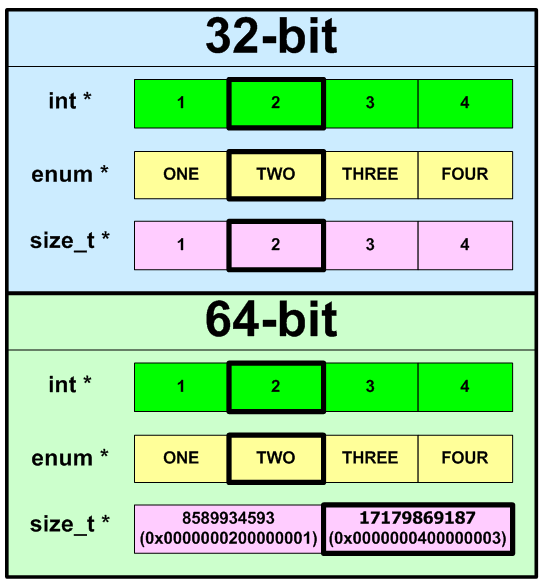 In examples it is always small and 64-bit registers may be used for counters. In real programs with large loop bodies an error easily occurs when the compiler saves the value of "i" variable in memory. And now let us make it out what the incomprehensible text you have just read means. When describing the errors, we often used the term "a potential error" or the phrase "an error may occur". In general, it is explained by the fact that one and the same code may be considered both correct and incorrect depending upon its purpose. Here is a simple example - using a variable of "int" type to index array items. If we address an array of graphics windows with this variable, everything is okay. We do not need to, or, rather, simply cannot work with billions of windows. But when we use a variable of "int" type to index array items in 64-bit mathematical programs or databases, we may encounter troubles when the number of the items excesses the range 0..INT_MAX. But there is one more, subtler, reason for calling the errors "potential": whether an error reveals itself or not depends not only upon the input data but the mood of the compiler's optimizer. Most of the errors we have considered in our lessons easily reveal themselves in debug-versions and remain "potential" in release-versions. But not every program built in the debug mode can be debugged at large data amounts. There might be a case when the debug-version is tested only at small data sets while the exhaustive testing and final user testing at real data are performed in the release-version where the errors may stay hidden. We encountered the specifics of optimizing Visual C++ 2005 compiler for the first time when preparing the program PortSample. This is a project included into the PVS-Studio distribution kit which is intended for demonstrating all the errors diagnosed by Viva64 analyzer. We will speak about the project PortSample in more detail in the next lesson. The samples included into this project must work correctly in the 32-bit mode and cause errors in the 64-bit mode. Everything was alright in the debug-version but the release-version caused some troubles. The code that must have hung or led to a crash in the 64-bit mode worked! The reason lay in optimization. The way out was found in excessive complication of the samples' codes with additional constructs and adding the key words "volatile" that you may see in the code of the project PortSample. The same is with Visual C++ 2008/2010. Of course the code will be a bit different but everything that we will write here may be applied both to Visual C++ 2005 and Visual C++ 2008/2010. If you find it quite good when some errors do not reveal themselves, put this idea out of your head. Code with such errors becomes very unstable. Any subtle change not even related to the error directly may cause changes in the program behavior. I want to point it out just in case that it is not the compiler's fault - the reason is in the hidden code defects. Further we will show you some samples with phantom errors that disappear and appear again with subtle code changes in release-versions and hunt for which might be very long and tiresome. It is that very overflow that must have been in the previous example. The value of the register r8d = 0x80000000 is extended in rcx as 0xffffffff80000000. The result is the writing outside the array. The compiler has decided to use the 64-bit register rdx to store the variable index. As a result, the code can correctly process an array with a size more than UINT_MAX. In the end let us consider an interesting but large example. Unfortunately, we cannot make it shorter because we need to preserve the necessary behavior to show you. It is the impossibility to predict what a slight change in the code might lead to why these errors are especially dangerous. This code cannot fill the array consisting of 50000*50000 items correctly. It cannot do so because an overflow must occur when calculating the expression "int result = x + y * width;". All this happened because the function UnsafeCalcIndex is simple and can be easily integrated. But when you make it a bit more complex or the compiler supposes that it should not be integrated, an error will occur that will reveal itself at large data amounts. I hope we have managed to show you how a 64-bit program that works might easily stop doing that after adding harmless corrections into it or building it with a different version of the compiler. You will also understand some strange things and peculiarities of the code in PortSample project which are made specially to demonstrate an error in simple examples even in the code optimization mode. We have finished studying 64-bit error patterns and perhaps you would like to experiment a bit with unsafe constructs and try PVS-Studio to detect them. 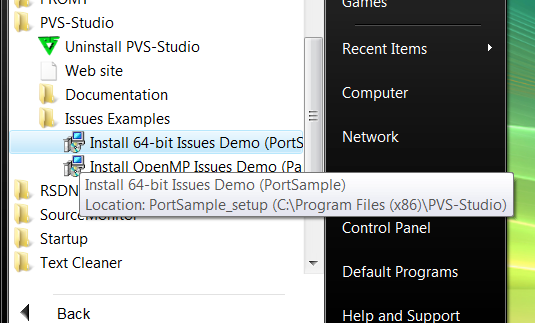 You may fulfill your wish by installing the demo project PortSample included into PVS-Studio (Figure 1). PortSample is a common C++ project that may be opened both in Visual Studio 2005 and Visual Studio 2008 (Figure 2). The project PortSample has a collection of examples for all the diagnostic warnings generated by the static analyzer Viva64 included into PVS-Studio when testing 64-bit projects. The warning messages are rather few (at the moment of writing this text, there are 25 messages), but each warning message covers a range of incorrect constructs. It allows us to arrange all the 64-bit errors into common groups with common descriptions. It enables us to avoid repeating the description of one and the same kind of errors in various forms for many times in the documentation. So you can not only look through the PVS-Studio documentation but really read it to learn all the specifics of 64-bit software coding. PortSample program's interface shown in Figure 3 makes it convenient to launch the code fragments you are interested in. We do not find it necessary to describe the content of the project in detail - you may study the code you need by yourself. You may also read the article "Some examples of the 64-bit code errors" where 64-bit errors are thoroughly described by an example from PortSample project. Note one very important thing concerning the use of the demo version of PVS-Studio. When the demo version is used to check the code, it detects all the potential errors but shows the exact location in the code of only some of them. Instead of the line number you see the text "TRIAL RESTRICTION" as shown in Figure 4. 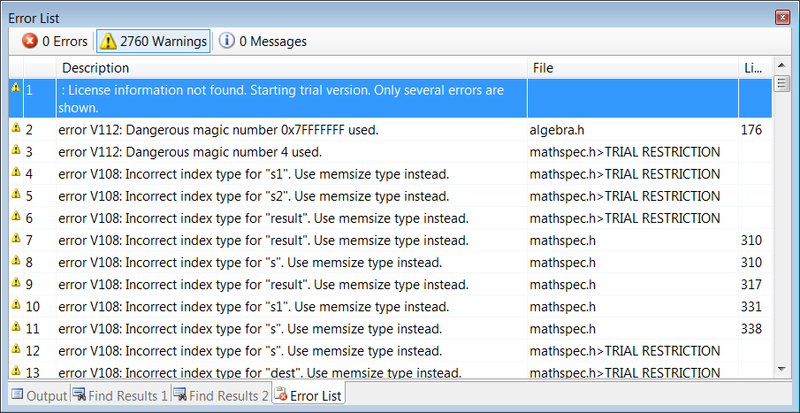 When the demo version of PVS-Studio is run with the project PortSample, it shows the location of all the errors. That is, PVS-Studio does not have any restrictions when dealing with samples (see Figure 5). You may modify the PortSample files with errors as you like and thoroughly study PVS-Studio's behavior when processing the code you have written. If you have questions about using PVS-Studio and PortSample project, ask the tool developers. We will be glad to receive your feedback and recommendations on how to improve PVS-Studio analyzer. Write to us by the address support@viva64.com. growth of stack memory consumption. We can often tolerate the growth of main memory consumption - the advantage of 64-bit systems is that very large amount of memory available to user. It is quite okay if a program takes 300 Mbytes on a 32-bit system with 2 Gbytes of memory and 400 Mbytes on a 64-bit system with 8 Gbytes of memory. In relative units, it means that the program takes three times less memory available on a 64-bit system. So it is unreasonable to strike against the growth of memory consumption we have described - it is easier to add just a bit more memory. But there is a disadvantage of this growth. It is related to performance loss. Although the 64-bit program code is faster, extraction of larger data amounts from memory might cancel all the advantages and even reduce performance. The operation of transferring data between the memory and microprocessor (cash) is not very cheap. One of the ways to reduce the memory being consumed is optimization of data structures we have told you about in Lesson 23. Another way of saving memory is to use more saving data types. For instance, if we need to store a lot of integer numbers and we know that their values will never exceed UINT_MAX, we may use the type "unsigned" instead of "size_t". Using ptrdiff_t and size_t types in address arithmetic might give you an additional performance gain along with making the code safer. For example, using the type int, whose size differs from the pointer's capacity, as an index results in additional commands of data conversion appearing in the binary code. We speak about a 64-bit code where the pointers' size is 64 bits while the size of int type remains the same - 32 bits. The variables "arraySize" and "i" in the example have the type unsigned. You can easily replace it with size_t and compare a small fragment of assembler code shown in Figure 1. The compiler managed to build a more laconic code when using 64-bit registers. We do not want to say that the code created using the type unsigned (text on the left) will be slower than the code using the type size_t (text on the right). It is a rather difficult task to compare the speed of code execution on contemporary processors. But you may see from the example that the compiler can build a briefer and faster code when using 64-bit types. Now let us consider an example showing the advantages of the types ptrdiff_t and size_t from the viewpoint of performance. For the purposes of demonstration, we will take a simple algorithm of calculating the minimum path length. You may see the complete program code here: http://www.viva64.com/articles/testspeedexp.zip. 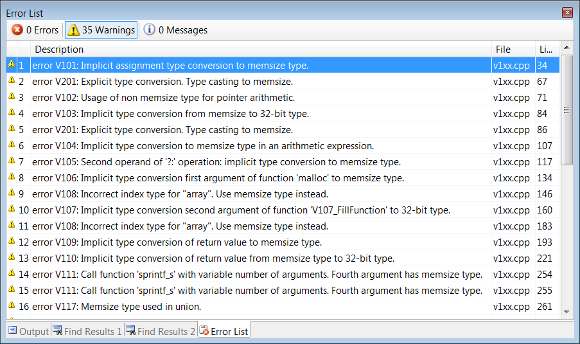 The function FindMinPath32 is written in classic 32-bit style with unsigned types. The function FindMinPath64 differs from it only in that way that all the unsigned types in it are replaced with size_t types. There are no other differences! I think you will agree that it cannot be considered a complex modification of the program. And now let us compare the execution speeds of these two functions (Table 1). Table 1 shows reduced time relative to the speed of execution of the function FindMinPath32 on a 32-bit system. It was done for the purposes of clearness. The operation time of the function FindMinPath32 in the first line is 1 on a 32-bit system. It is explained by the fact that we took this time as a unit of measurement. In the second line, we see that the operation time of the function FindMinPath64 is also 1 on a 32-bit system. No wonder, because the type unsigned coincides with the type size_t on a 32-bit system, and there is no difference between the functions FindMinPath32 and FindMinPath64. A small deviation (1.002) only indicates a small error in measurements. In the third line, we see a performance gain of 7%. We could well expect this result after recompiling the code for a 64-bit system. The fourth line is of the most interest for us. The performance gain is 15%. It means that by merely using the type size_t instead of unsigned we let the compiler build a more effective code that works even 8% faster! It is a simple and obvious example of how data that are not equal to the size of the machine word slow down algorithm performance. Mere replacement of the types int and unsigned with ptrdiff_t and size_t may result in a significant performance gain. It concerns first of all those cases when these data types are used to index arrays, in address arithmetic and to arrange loops. Note. Although the static analyzer PVS-Studio is not specially designed to optimize programs, it may assist you in code refactoring and therefore make the code more efficient. For example, you will use memsize-types when fixing potential errors related to address arithmetic, and therefore allow the compiler to build a more optimized code. Intrinsic-functions are special system-dependent functions that perform those actions which cannot be performed at the level of C/C++ code or that perform these functions much more effectively. Actually, they let you get rid of inline-assembler because it is often undesirable or impossible to use it. Programs may use intrinsic-functions to create faster code due to absence of overhead expenses on calling common functions. The code size will be a bit larger of course. MSDN gives a list of functions that can be replaced with their intrinsic-versions. For example, these are memcpy, strcmp, etc. The compiler Microsoft Visual C++ has a special option "/Oi" that lets you automatically replace the calls of some functions with their intrinsic-analogs. Inline assembler is not supported by the compiler Visual C++ in the 64-bit mode while intrinsic-code is. Intrinsic-functions are simpler to use as they do not require knowledge of registers and other similar low-level constructs. Intrinsic-functions are updated in compilers while assembler code must be updated manually. The built-in optimizer does not work with assembler code. Intrinsic-code is easier to port than assembler code. Using intrinsic-functions in automatic mode (with the help of the compiler switch) will let you get some free percent of performance gain, and "manual" use even more. That is why using intrinsic-functions is quite reasonable. 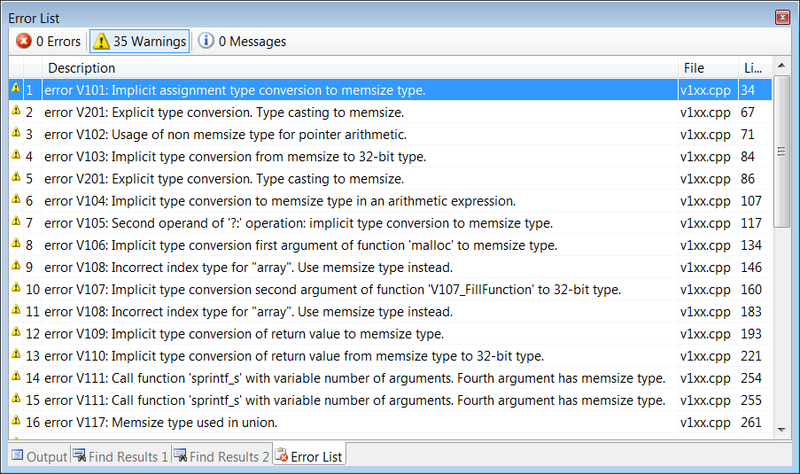 To know more about using intrinsic-functions, see the Visual C++ team's blog. The sources "Porting and Optimizing Multimedia Codecs for AMD64 architecture on Microsoft Windows", "Porting and Optimizing Applications on 64-bit Windows for AMD64 Architecture" cover these issues very thoroughly. To learn more about the issues of optimizing 64-bit applications, see the document "Software Optimization Guide for AMD64 Processors". When developing the 64-bit version of an application, you should also be very attentive to the issue of program distribution - you might encounter some peculiar problems when installing the program on a 64-bit operating system, and if you forget about them, you will get a non-working installation package. First of all you should understand that the program installer itself (the exe-file that launches the installation process) can technically be either a 32-bit application or a 64-bit one. If you make this installer 64-bit, it will not work on a 32-bit system. Note that you will not see a message like: "You are trying to install a distribution kit of a 64-bit program on a 32-bit system". It will simply generate a message about a damaged file. Thus, it is most often reasonable to make the installer a 32-bit application even if it will be installed only on a 64-bit system. An important issue of operation of 32-bit programs in the 64-bit environment is the redirection mechanism implemented in Windows. This mechanism arranges the work of obsolete 32-bit applications so that when trying to access, for instance, the folder "c:\program files", they are automatically redirected to "c:\program files (x86)". The access to some register sections is also automatically redirected. When developing installers, the redirection mechanism may often lead to a situation when the files appear in some other place than the developer has expected, or the register entries relate to some other sections than they should. You may read about the redirection system in MSDN Help system: "File System Redirector". All these specifics can be set in any contemporary installer but you should not forget about it while creating a distribution kit compatible with 64-bit operating systems. When developing installers for 64-bit versions, developers often make one common installer that contains both the 32-bit and 64-bit versions of the applications and their components. In this case, do not forget to add full sets of components and dependent libraries. For example, developers often add Visual C++ Redistributable Package into the installation package for applications developed with Visual C++. This package must be included both for the x86 and x64 versions. If your installer uses some third-party units to implement complex functionality, you should remember about the restriction - units built for the 64-bit mode cannot load 32-bit dynamic libraries and vice versa. Starting to plan the port of your project to a 64-bit system, you must be able to estimate the amount of work and material costs. Let us consider those components that make up the total cost of creating a 64-bit software product. If you find it difficult to estimate the cost of the move to 64-bit systems, you may contact experts of our company "Program verification systems" for advice. Our company can also take a part of or all the work of adapting your projects for 64-bit systems. Nowadays you can hardly find a developer who has a computer with a 32-bit microprocessor. But you still should remember that you must have a 64-bit computer that will let you manage all the tasks you have to solve. It seems that the most real case is when 64-bit hardware architectures still work under 32-bit operating systems. You should take into consideration expenses on purchasing and installing 64-bit versions of operating systems. Consider also additional expenses related to changing the version of the operating system, for example, reinstallation of various software. Add the price of purchasing and mastering new compilers able to create 64-bit code to the total price. You might need to purchase 64-bit versions of libraries and other components. Find out beforehand about the pricing policy of those companies whose components are used in your project. Sometimes 32-bit and 64-bit versions of components are sold separately. If you use open-source libraries that have no 64-bit configurations yet, be ready to spend much time on modifying them manually. Take into consideration the time needed for your employees to study all the necessary information on 64-bit system development. You may also need to buy some additional tools such as, for example, PVS-Studio. As you already know from the previous lessons, compiling a 64-bit configuration is only the beginning. In most cases, you will need to find and correct a lot of defects that will occur in 64-bit code. It is perhaps the most laborious yet most difficult to estimate part of the work. However we can advise you the following way relying on PVS-Studio static analyzer. Well, you have several (tens, hundreds) Mbytes of source code ready for migration. There is no 64-bit configuration of the code yet. So, there are no files to be compiled in the 64-bit mode as well. PVS-Studio provides you with a capability to detect 64-bit code issues even in 32-bit projects. It is this capability that will let you estimate the difficulty of migration BEFORE creating the 64-bit configuration of your project. Of course, this fragment will be skipped when testing the code in the 32-bit mode. Or, more exactly, while there is no 64-bit configuration yet, the application code might have no such a fragment. Here is another important thing: it is natural that data types differ depending upon the project configuration. That is why the check in the 32-bit and 64-bit modes will nearly always lead to different results. But how much different will they be? According to the results of the experiments carried out in our company, we have the following: the lists of diagnostic warnings generated by PVS-Studio analyzer when testing projects in the 32-bit and 64-bit modes coincide 95-97%. It means that not more than 5% of diagnostic messages differ. These results were obtained in the following way. We took the code of real projects, checked it in the 32-bit mode and saved the list of diagnostic warnings. Then we checked the code of the same projects in the 64-bit mode and also saved the list of diagnostic warnings. After that we compared these lists and estimated how many percent of the diagnostic messages coincided. Since the whole procedure was performed in automatic mode, the number of projects that were analyzed was enough (more than 20 projects with the code size of several Mbytes each). So we may conclude that the figures (5% difference) can be trusted. Of course, you should not hurry to fix all the potential errors detected in the 32-bit configuration of your project - it is better to wait for the 64-bit configuration. 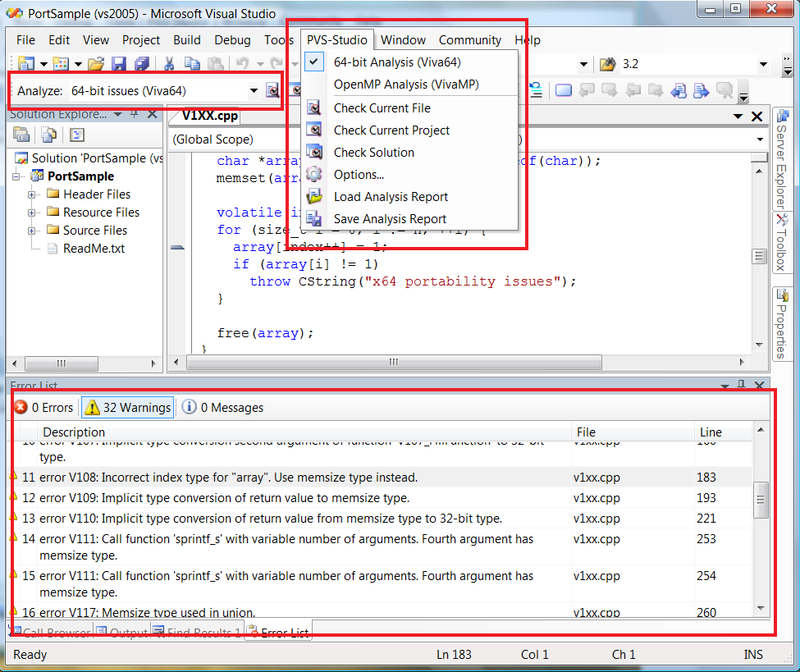 But you can easily estimate how much time you will need to check all the warnings generated by the code analyzer. 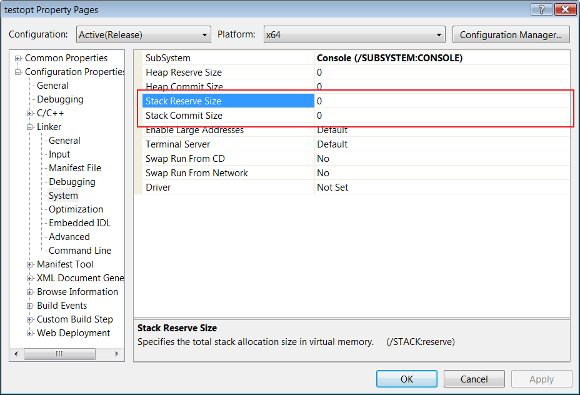 Analyze the 32-bit configuration of the project with PVS-Studio. One programmer who knows well the issues of 64-bit code looks through the warnings generated by the analyzer during a day and decides if this or that error is relevant to the project. If it is, the programmer corrects it. The total number of the analyzer-generated messages is divided by the number of the messages the programmer has looked through and processed during one day. The number you get is the number of man-days needed to port the application's code to a 64-bit platform. The programmer must correct the errors found. It is not enough just to find an error and imagine that it is corrected. To detect and to correct are actions that differ in time they take. You may need to modify the program code in many project files to correct some errors. To avoid an understated estimate, you must make all the necessary corrections. Of course, there is a drawback in this algorithm of estimating the migration process - it is the skill of the developer who will process the messages of the analyzer and modify the code during a day. So we recommend you to be very serious and careful when choosing a programmer responsible for the estimate. This person must be an experienced programmer who has been working in your company not less than for three years and who knows this particular project you want to port. The programmer must be familiar with the issues of 64-bit code - for example, know these lessons or the article "20 issues of porting C++ code on the 64-bit platform". It is desirable that the programmer understand the principles of working with static code analyzers. It is not an obligatory requirement but understanding the static code analysis technology makes the estimate of the migration process more adequate. The person must be able to stay within the usual working conditions during the testing day. He or she must not try to set up a record of performance to impress the colleagues. One cannot work all the days in such a way, and the terms will be estimated incorrectly. Following these recommendations will allow you to get an adequate estimate of the cost and term of the 64-bit software migration process. Consider the cost of adapting your testing system for full-fledged testing of 64-bit units. If your programs process large data amounts, you must have tests that run on data amounts more than 4 Gbytes. In its turn, integration of heavy tests might result in the task of test parallelizing. In this case you might have to buy additional tools. If you use software or firmware systems of software copying and cracking protection, you should add the price of implementing protection for your 64-bit code to the total cost. Perhaps you will have to master new protection systems if those systems you are using at present do not support 64-bit codes. You might face other unexpected troubles, so make sure you have some time in reserve to manage them. You will have to create a new distribution kit - this issue was considered in the previous lesson. Contacts: e-mail: support@viva64.com, Tula, 300027, PO box 1800.